Boring Brussels sprouts get their long due make-over and finally become an exotic side-dish that will wow your guests! Brussels sprouts are one of the few vegetables that people either really hate or really love. As with a lot of people growing up I despised them when I was a child. They are bitter and stink! Throughout the years, however, I learned to love them! With a few little additions Brussels sprouts can become really delicious, no matter if you fry, roast or cook them. One of the easiest ways to make people fall in love with the bitter sprouts is adding a touch of bacon! Render some bacon rashers in a skillet until crispy. Remove the bacon and stir-fry the sprouts in the bacon fat. Toss with some pecan nuts, a splash of cider vinegar and the crumbled bacon. Absolutely delicious! If you are looking for more bacon and sprout combinations check out my new book Flavor Math. You can use bacon in this recipe, but it’s not by definition necessary. The book is available digitally (PDF) as well! But back to making Brussels sprouts truly exotic! 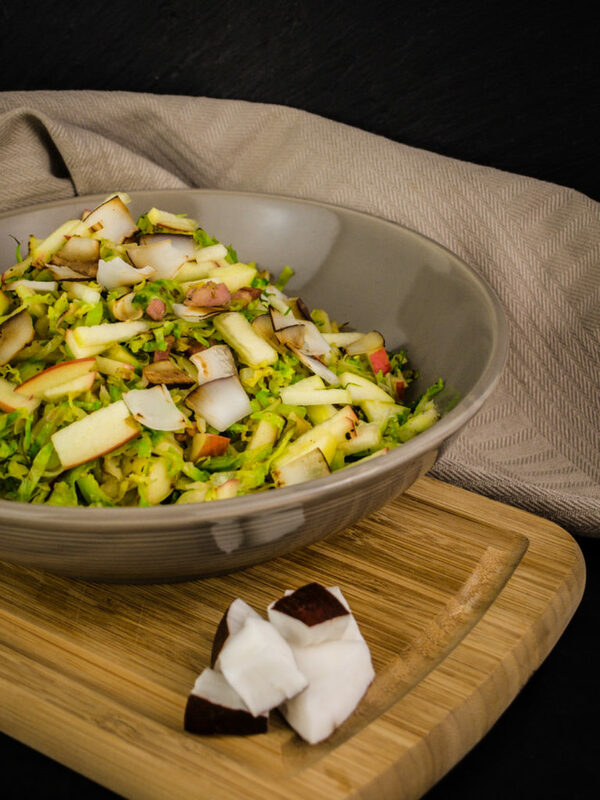 The combination of sprouts with apple and coconut may seem strange at first, but bear with me here! Some toasted nuts alongside Brussels sprouts would add a nutty flavor and a little crunch, right? This is where the coconut shavings come in. By toasting them they get a nutty roasted flavor and crunch. The apple gives the dish a fresh little kick. Combined with the mild coconut flavor the two lift this dish to delicious exotic heights! This side dish is perfect alongside some roasted chicken and potatoes. And remember: A little crumble of bacon never hurt anyone. Take one Brussels sprout, cut it in half through the stem. Cut into very thin slices. Continue with the remaining sprouts. Grate the apple (skin-on), discard the core. Place the grated apple in a small bowl, add the lime juice and give a good toss. Cover with plastic wrap to keep it from browning. Put a skillet with high rim onto medium high heat. Add coconut shavings and keep stirring until toasted, brown and fragrant. Remove toasted coconut from skillet immediately and reserve for later. Wipe out the pan with a kitchen towel. Add coconut oil to the pan. Optionally, fry the bacon in the coconut fat for 4 minutes until it starts to brown. Add the shredded Brussels sprouts, two pinches of sugar, two tablespoons of water, as well as a pinch of ground nutmeg. Sauté on high heat until browned and crispy around the edges – about 5 minutes. Quickly but thoroughly combined with the apple, so that the grated apple remains crunchy. Transfer toa serving tray and sprinkle with the toasted coconut shavings! Have you ever thought of combining Brussels sprouts with apple before? Ever considered pairing them with coconut? If you have any comments or other interesting ways to make sprouts even tastier, let us know in the comments below! If you want to learn more about flavors and how to combine them, check out my second book “Flavor Math” which is available digitally (PDF)! PS: This recipe is inspired by the idea that Brussels sprouts share chemical flavor compounds with apple and coconut. That’s why they work so well together. Check out James Briscione’s book on food pairing if you are interesting in digging deeper into this!